The FD5000 has a very short case length making it ideal where the panel depth is limited. Two fascia types are available, making it possible to display the set points of high and low limits, as well as the actual process value. 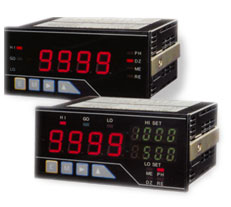 Typically the FD5000 panel meter is used as a digital display or process indicator for pressure, temperature level or flow measurements. It is possible to include options to provide a power supply for a 24v loop powered transmitter, or the retransmission of the process measurement using analogue (4-20mA) or digital retransmission signals (RS485). This panel meter is available ex stock at very competitive prices. If you would like assistance with your application or would like price and delivery details why not click on the link below. Pressure, Temperature, Level, Flow... All you need to to get a 4-20mA signal to the panel indicator.